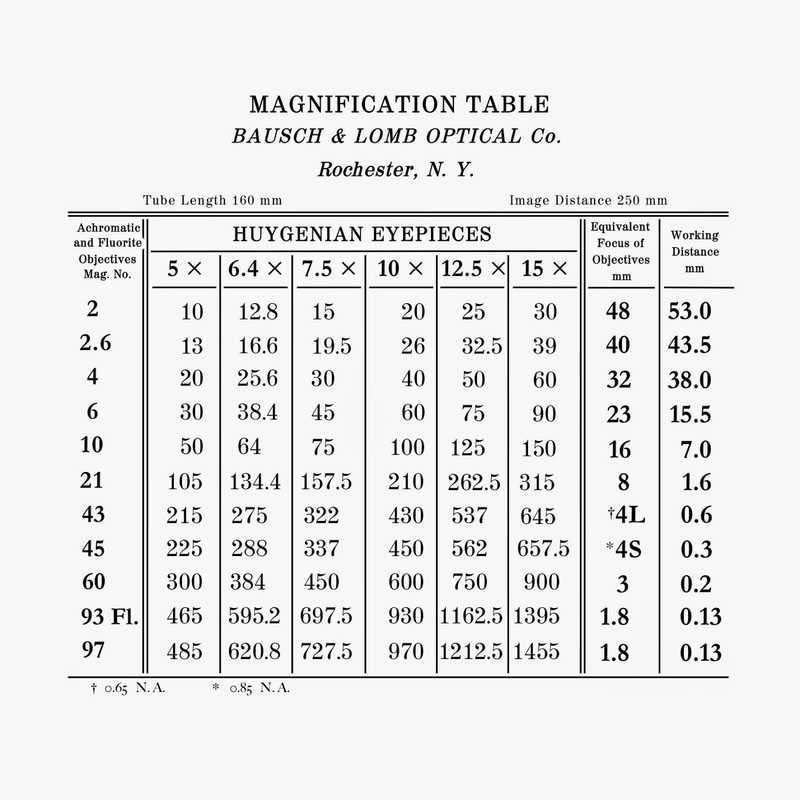 As far as I can tell Bausch & Lomb didn't include a magnification table inside the lid of their microscope cases. This was common practice for most European makers. 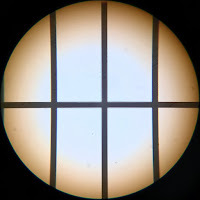 Sometimes filled out by hand for the objectives and eyepieces included with the instrument, sometimes it was a table of the full range with the included pieces underscored or circled. What B&L did include with their instruments was the booklet on the use and care of the microscope. And on page 31 of the '37 printing is included a magnification table for their entire range. Here reproduced to be able to print and rectify this small oversight of Bausch & Lomb. For reference (if you happen to have a B&L biological microscope), though multiplying the two values is not too hard of course. One other number that can be handy to pencil in on this table is the diameter of the viewed image. To determine this, a calibration slide was sourced. From local, reputable dealers in matters microscopical these are startlingly expensive. However from the global 'dime-store' that is the internet, these can be had at very affordable prices including shipping half-way around the globe. These do not include a calibration report and certificates of course. As such these cheap 'calibration slides' are probably unacceptable for proper laboratory use, but excellent for the hobbyist. 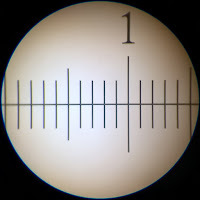 Viewing the linear scale of the calibration slide using the 10 x eyepiece and successively with the 4, 10 and 43 objective yields the diameter of the image viewed at about 4.3 mm, 1.6 mm and 0.4 mm. 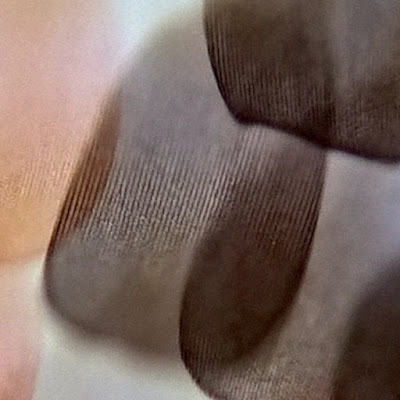 Looking at the scales of a butterfly wing, then for example the size of the individual scales can be estimated. 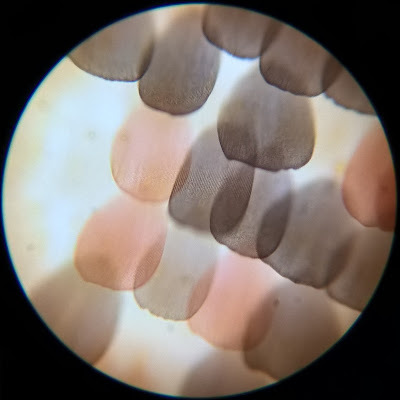 The below image was taken with the 430x magnification, thus the diameter of the image is around 400 micron. 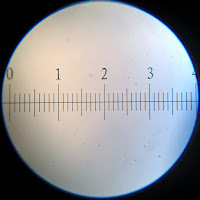 The width of the scale in the centre of the image is thus about 76 micron. Zooming in further on the digital image shows the ridge-pattern of the individual scale. 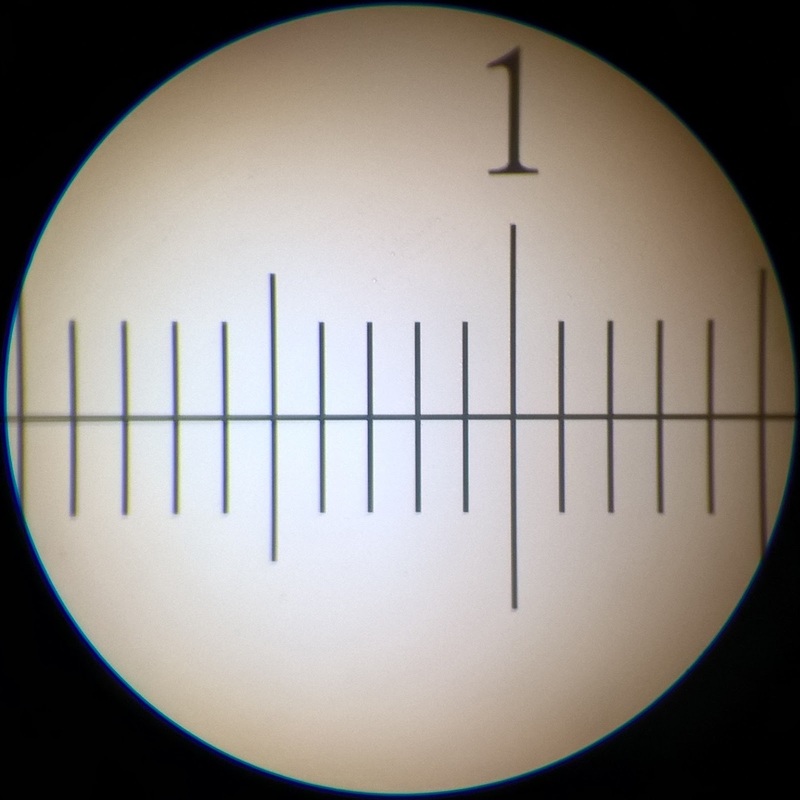 Also very clearly evident is the very small depth of focus at this magnification. Note that viewing whilst fiddling with the fine-adjustment gives a much better impression of the object being viewed than a static digital capture. These individual ribs on the centre scale can be counted (about 49), making these ridges approximately 1.6 micron apart. That is quite impressive and close to the maximum achievable for a light microscope. Brings back memories from my biology classes.